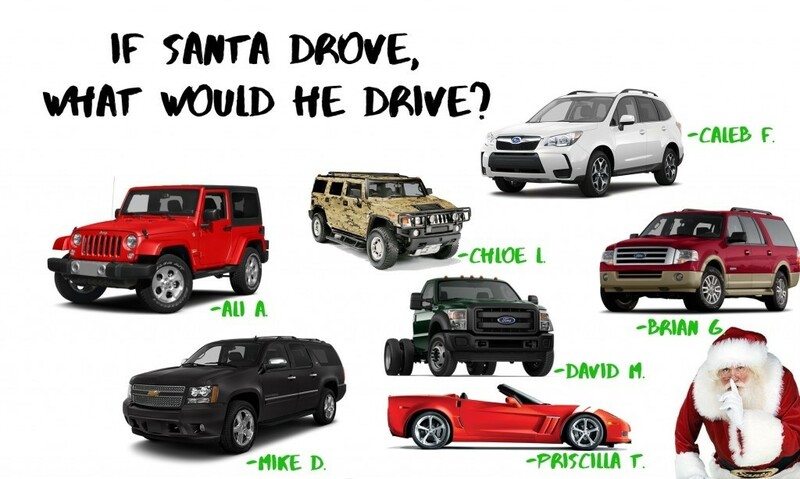 What would Santa drive?” In search of an answer to that question, we asked our employees and people in our community what they thought. Though the question was intended to be a light question, some people replied with some well-thought-out responses and others couldn’t decide on an answer. While bigger cars were in several answers, everyone’s idea of Santa is unique. Take a look through our answers below. What do you think he would drive? Feel free to share your response with us and we’ll add your response to this post. “Face it, Santa is a trucker. With that weathered skin, the massive beard, the overnight shipments, and all of that snow ;-)… Let’s be serious though, it is Santa and Santa also requires luxury. Santa don’t play that bottom life traveling, this is why Santa would drive a 2016 Ford F-550 V8 Diesel Chassis Cab. This truck is massive and it has all the towing power any one person competing with Amazon will ever need.”– David M.
“Santa would have a fuel-efficient camo Hummer because he has a huge load to carry and he needs to travel in the most difficult terrains, but he doesn’t want the North Pole to melt away so it would need to be fuel efficient.” — Chloe L.
“Santa doesn’t drive. After riding behind nine reindeer, Santa’s learned that the best spot to be is in the back and that the front seat is overrated.” — Monique B. “Santa needs lots of room for presents, so he’d drive a Ford Expedition EL which has almost 131 cubic feet of cargo space.” — Brian G.
“Whatever the vehicle, it certainly needs to be 4-wheel drive and have plenty of cargo space. It should also have heated and cooled seating so Santa can stay warm in the colder climates and cool as he heads to the more tropical areas. I’m thinking Chevy Suburban. The Suburban has tons of cargo space, 4-wheel drive and a huge towing capacity for towing a sleigh! I’d go with standard, factory Black exterior, so Santa can blend into the night sky with little detection and, just in case, upgraded 20″ wheels, because Santa needs to look cool, if spotted!” — Mike D.
“A red convertible.” — Priscilla T.
“I think Santa would drive a Subaru Forrester since it’s all-wheel-drive, which is important in cold weather conditions, has decent passenger capacity, and better than average fuel efficiency. Plus, I want one.” — Caleb F.
Caleb, come to Driver’s Auto Mart and check out our selection of cars for a Subaru Forrester. We add new cars to our inventory all the time and have a great selection of makes, models and years. ‘Tis the season. 0 comment(s) so far on What would Santa drive?